When you start living in Germany it soon becomes apparent that they take their recycling seriously. In many public places - train stations and shopping arcades for example - you will see not one litter bin, but four. These are labelled and coloured to indicate which type of waste you are allowed to deposit in them, and woe betide you if you use the wrong one! 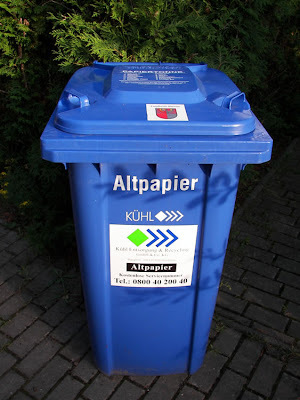 Blue (blau), labelled 'Papier', is for clean paper waste, e.g. newspapers, paper bags, expired rail tickets, and flyers for concerts or special promotions handed to you in the street. Don't put your snotty paper tissues, ice lolly wrappers, or secret Stasi files in here. Yellow (gelb), labelled 'Verpackung', is for plastic bottles, cellophane wrapping, and aluminium drinks cans. It is also for anything that has a recycling symbol on the packaging, but don't assume that because a banana came in its own natural packaging, you can throw its skin in here. The deposit is not much, so if you feel like you don't want to lug it around then at least put it in the (yellow!) bin without crushing it; there is a whole army of people out there who search through bins for items with a Pfand on them and collect the money for themselves. Green (grün), labelled 'Glas', is for - yes you've guessed it - glass items, which will generally mean glass bottles unless you've just finished a jar of Spreewald pickles for your lunch (yummy!). Before discarding your beer bottle though, be aware that all beer bottles have a Pfand (deposit) on them. You paid this extra for your bottle of Germany's best when you bought it, and you can claim it back. The same as with most plastic drinks bottles, these can be returned to the place you bought them, where they are under obligation to take them back. 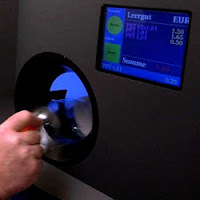 Alternatively many supermarkets have an automatic bottle return machine: you insert your beer bottle (or plastic bottle with a Pfand on it) bottom first into a hole, a series of rollers rotates the bottle whilst lazers read the barcode, and if the machine decides your bottle has a Pfand on it, it will display the deposit amount. You can feed in as many bottles as you want, and when you have finished you press a (usually) green button which prints out a bar-coded receipt which you can hand to the cashier for re-imbursement. If you have had a heavy drinking session, note that many of these collection points can automatically take whole creates of bottles back as well. Photo of Pfandautomat in action. Copyright Spiegal Online. Also like plastic bottles and cans, there are people who make a (desperate) living going through the bins and collecting beer bottles. Don't assume that they are drunks who are collecting every last dreg of beer they can find, this is not the case. To be sympathetic to their plight, if you don't want to collect the Pfand on your bottle then put it in the appropriate (green) container, and not with e.g. stubbed out cigarette butts in them (not nice!). Having said all that about the Pfand on beer bottles, you should be made aware that wine, spirit, and HP Sauce bottles never have a Pfand on them (they are exempt because they are not fizzy - go figure! ), so don't worry about just throwing those bottles in the green bin. Red (rot), labelled Restmüll, is for everything else. Apple cores, half-eaten Bratwurst, broken umbrellas, cigarette butts, spent gun cartridges, Jeffrey Archer novels etc., in fact anything that nobody could possibly find redeemable value in, and which just needs to be incinerated or land-filled or buried at the bottom of the ocean. Obviously this is not the preferred option, so try not to buy these things in the first place (especially the Jeffrey Archer novels), or if it is compostable take it home with you for the compost heap. By the way, using these bins properly seems to be so ingrained in the German psyche that I once saw late at night on a station platform a man rather worse for wear knock over and break his bottle of Weissbier. He could hardly stand up, but bless him he crawled on his hands and knees and picked every last bit of glass up and put them in the correct bin (the red one by the way - the green one is for unbroken glass!). Of course, that might have been because the other people on the platform were all glaring at him and mentally tutting, but anyway. Just shows. 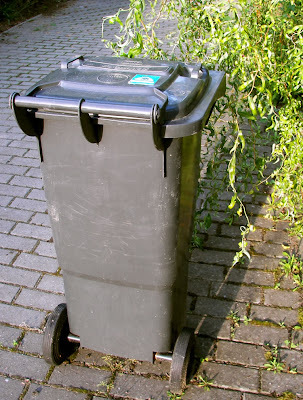 The household recycling regime probably differs slightly from German region to German region, but I'll use our waste collection system as an example (Barnim in Brandenburg). any recyclable metal such as bottle tops, aluminium foil, tin cans, aerosol cans etc. juice, drink, and milk cartons; vacuum packaging; cellophane wrapping. carrier bags*, crisp packets, and sweet or chocolate bar wrappers. non-Pfand plastic bottles, such as shampoo bottles, washing up liquid bottles, etc. margarine cartons, yoghurt pots, kartoffelsalat containers etc. bubble-wrap, expanded foam containers, burger cartons etc. 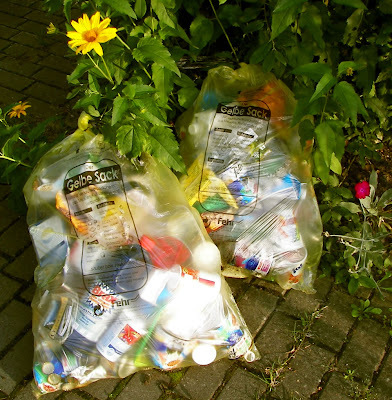 Before you put recyclable into your yellow sack though, all items must be washed and cleaned. Yellow sacks can be obtained free of charge from council designated places such as some supermarkets, petrol stations, and in our case the garden centre. The paper bin is enormous, so actually we mostly use it to store the yellow-bagged rubbish in until collection day. They are collected every four weeks, coinciding with every other yellow bag collection. If you do get overwhelmed with paper stuff though (we did when we moved in because everything was packed in cardboard boxes, and it was a bit far to take them back to Sainsburys), then there are paper collection bins (blue of course) at neighbourhood recycling centres. By the way, by law there is a cost-free 'Rücknahmesystem der Verkaufsverpackungen' which means that anybody who sells you anything, or delivers any goods to you, which comes in packaging (including those polystyrene filler pellets or 'quavers') are obligated to take back the packaging and recycle it for you free of charge. That applies whether it is all the cardboard and pins in a new shirt from H&M, or a Billy Bookcase from Ikea. I've not actually tested this in practice though. For compostable waste, that is uncooked non-meat foodstuff, coffee and tea leftovers, eggboxes, cat fur and garden clippings, we have a compost bin in the garden. If you have a lot of this, or you live in an apartment flat, you can request (or have provided by the apartment block owner) a brown bin. Or, you can buy clear plastic bags from the same place you get the yellow bags. These are pricey, but they do have a telephone number on to ring to request they are collected (there is a monthly collection). Note that installing a garbage disposal unit on your sink is illegal in Germany. As is flushing food-stuff down the toilet (and of course condoms etc). I'd hate to be the inspector who detects infringements of this law, but anyway, you have been warned! For glass there are a number of the usual recycling centres around, which have seperate containers for white, green and brown glass. What we found interesting is that there are notices on these (in our village anyway) which say you must only use them on a working weekday and between 8am and 1pm, and 3pm till 7pm. Which is fair enough; if you live next door to one you don't want your afternoon snooze or Sunday barbecue disturbed by the sound of clattering glass. Batteries of all kinds are taken care of by collection boxes ('Batterieboxen) at supermarkets, and Pharmacies (Apotheken) will take back unwanted prescription drugs (or try down Görlitzer Park in Berlin - no, only kidding!). For other hazardous substances (which includes cans of paint, turpentine, paint-stripper, epoxy resins, WC or oven cleaner, hairspray, disinfectant,bleach, sunscreen cream (! ), glue, metal and furniture polish, garden chemicals, pesticide, fungicide, creosote, wax (wax?! ), thermometers, anti-freeze, surgical spirits, shoe-polish, drain cleaner, weed killer, grease, oil, varnish, fabric softener, and no doubt the gunk out of the bottom of the fridge) there is a collection van which comes around twice a year (in our case, Spring and Autumn). Asbestos and insulating fibre-glass wool you have to bag up securely and take to a recycling centre (Recyclinhof). We used the 'hazardous waste mobile' (in German 'Schadstoffmobil') to get rid of a load of cans of dubious material left by the previous owner of our house after we moved in. I don't know what it was exactly, but the giuys collecting it didn't pale to a ghostly shade of white when I handed it over. You can request a collection of bulky waste items ( in German, 'Sperrmüll') such as old sofas, broken furniture, electrical goods, bath-tubs and so on from the Council. They send you a card to fill in about the nature of the stuff to be collected and how much cubic metres of space it takes up. You send that back and they send you a time and date for collection. You can only request to do this twice in a calendar year, so people tend to wait until December before they get rid of these items. Otherwise, there is an electronic scrap pick-up service ('Elektroschrottabholung') operated by the Council each month, but you need to phone up and request it at least a week in advance of the collection dates they give you, and it costs 15 Euro. Actually, there is often no need to get rid of old TV's and anything containing metal in this way. We regularly get slips of paper pushed through our letter box advertising a collection by a local scrap-metal dealer who will take your stuff away for free. Also, if you leave your rubbish out for bulky waste or electronic pick-up in the evening, you will be surprised how much of it mysteriously dissapears overnight before the Council get there! Also, the capacity is only half of the height you see there. 60 litres in fact. You can request a larger one if you really want to, but you have to pay extra. In here go, in our case, occasional cat litter, bagged up un-eaten cat-food, bagged-up cat sick, holey socks, and hmm, not a lot else really. These bins are collected every three weeks. I think Daily Mail readers back in England would go apoplectic if they were given only such a small bin and they weren't collected on a weekly basis. If you have an emergency, you can buy Hausmüll sacks from the same places you pick up your yellow sacks and put them out at the same time as your bins. These sacks do come at a price though, to include the cost of collecting them. When we first moved, and before we realised why the Council wasn't collecting our bin (no up-to-date sticker on them - see below) we had to resort to using these to get rid of the detrius left behind by the previous owner. Watching the bin collection process is almost worth the cost by itself: the bin van drives slowly along and as it goes by a bin a robotic arm with big pincers shoots out, picks the bin up and empties it into the van before delicately putting the bin back again! Finally, don't overlook the collection containers for (washed and wearable) old clothes, shoes etc operated by charity organisations, for example the DRK ('Deutsches Rotes Kreuz' - German Red Cross). These are often located at neighbourhood recycling centres and dotted around street corners. If you have transport and are in a hurry to dispose of your waste, then there is always the local Recyclinghof / Deponie. These are household recycling centres which take all of the above, but you have to pay and you have to take the stuff there yourself. These are also the place of last resort if you have something really hazardous or obnoxious, such as asbestos or old Deutscher Schlagermusik CD's. Anyway, that's about it for waste collection in Germany. Obviously things are different if you live in an apartment; you will have a communal bin area (probably lockable) and the costs of garbage removal will be absorbed into your rent. You'll still have different coloured bins though, and God forbid (Gott bewahre!) you are caught by your neighbours using the wrong bin! This is such a brilliant blog post, full of so much useful information. Just thought I would comment to say how much I have enjoyed reading your blog since my last comment when I wondered if you could include pictures. Whilst you don't seem to get many comments, I am probably just one of many silent but appreciative readers. I am going to Berlin from the 3rd to the 7th August and was wondering if you had anything particular you would recommend I see/do other than all the touristy stuff. Thanks for your kind comments. It is good to know someone is actually reading them! See, I took your advice on board and added more pictures. I have just added some more to this article on recycling in fact! See or do other than the touristy stuff ... hmm Matt, that's difficult to answer if I don't know what you are in to. Berlin is such a diverse city that anything you are seeking is probably there. If you're done with the Alexander Platz/Museuminsel/Unter den Linden/Gendarmenmarkt/Checkpoint Charlie/Brandenburg Gate/Potsdamer Platz/Reichstag/Berlin Zoo/K'damm/Olympiastadion tourist honey-pot sites then there is still so much to see. After a year we still haven't scratched the surface. And then there are the places around Berlin and the outskirts to explore: Potsdam, Babelsburg, Spandau, Köpenick, Wannsee ... all easily reachable by an ABC ticket. Plus with a Brandenburg rail ticket ... oh my oh my! It's like trying to recommend somewhere non-touristy to go in London. If you like hiking, water sports, classical music, art of all kinds, sport, clubbing, history, architecture, sun-bathing, cycling, shopping, world foods, or just slumming it in sleazy dives, there is somewhere for you!